Rockstand, one of the few free knowledge applications, lets reading fans breathe a sigh of relief. The ebook and emagazine app is a creation of Praveen Rajpal, currently the CEO of Handygo Technologies. A strong believer in innovation, Rajpal created Rockstand to cater to readers, publishers and techno enthusiasts. We love that it strongly protects copyrights and doesna��t allow copy, cut and pasting at any cost, giving publishers the advantage and giving writers their due. So if you are thinking of sneaking in a quick screen save for a read latera��forget it! With a selection of over 600 publishers across the globe, their growing library houses 1.25 lakh titles. a�?Whatever genre you pick, there will be vast choice,a�? 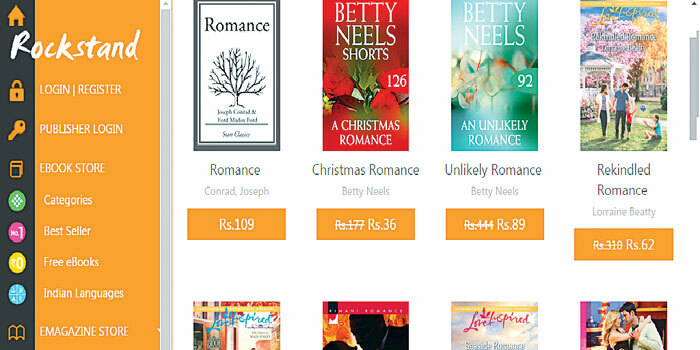 Rajpal says, adding that romance, education, fiction, kids, travel and cooking are the more common genres while there is a section for religious, foreign languages and health books. GQ, Vogue, PC World, Femina readers too can get a piece of this pie. As can comic book lovers and gamers (think Call of Duty cheats!). You can store 400-600 books at one go, and read anytime you like with their Day/Night mode which brightens the backlight in darker environments and even auto bookmarks. Already with a whopping 4.5 lakh users, Rockstand is quite user friendly for even non-techno followers. a�?It also lets users store their books on cloud equivalent space to read in offline mode, keeping in mind the availability of low space in Indian manufactured smart phones,a�? shares Rajpal, elaborating that they even allow users to connect to their mobile operator so they can pay for an ebook with talk time. On Android, iOS and Windows.